The challenges facing public sector workers and CUPE have never been greater, and CUPE National Secretary Treasurer Charles Fleury says the union has a battle plan ready to face those challenges. 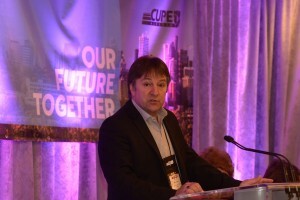 Fleury told convention delegates that while revenues are tight, CUPE is allocating resources with an eye to giving locals the power to make gains at the bargaining table. Fleury reminded delegates that changes made to the National Strike and Defense Funds at will Increase CUPE’s campaign power, allowing more funds for local, regional, and National campaign initiatives. Finally, Fleury said that with a large number of new staff, CUPE is investing in training.